Apply Now for the Summer Youth Employment Program! Each summer, thousands of New York City young people, ages 14 to 24, get a job opportunity through the Summer Youth Employment Program (SYEP). The application is now available. We strongly encourage District 8 youth to apply, and we hope you will share this information with your family, friends and neighbors. Click here to apply online now. You can also download a paper copy for submission by mail, by clicking here. The application is due on May 21st. SYEP is a City program that places young people in summer jobs in a variety of sectors, including government, nonprofits, summer camps, cultural institutions, small businesses, law firms and others. Participants are chosen by lottery. In this seven week program, young people have the opportunity to gain skills and work experience, while also making some money. Click here for more information on SYEP. This entry was posted in Citywide, Opportunities. Bookmark the permalink. how can i get my son summer job thi is his 1st time ever. Unfortunately, the deadline to apply has passed. Be sure to check the website provided above sometime in the spring of next year for the updated application and materials. when will they notify us if we get accepted or not? As far as I can tell, DYCD has not published a timeline of when you might find out if you have been accepted, but you can visit the following page to check the status of your application: https://application.nycsyep.com/Pages/StatusLogin.aspx. This may give you some indication as to where you stand. What is the Age range.. is it 14-24 or 27? If I remember I thought that they changed the age range. Please note: Applications are generally available for the upcoming SYEP year around April/May. We will be sure to keep you updated about SYEP 2013. The application process for this summer does not start until April (http://www.nyc.gov/html/dycd/html/jobs/jobs_internships.shtml). We will make sure to update our blog when the forms are available. 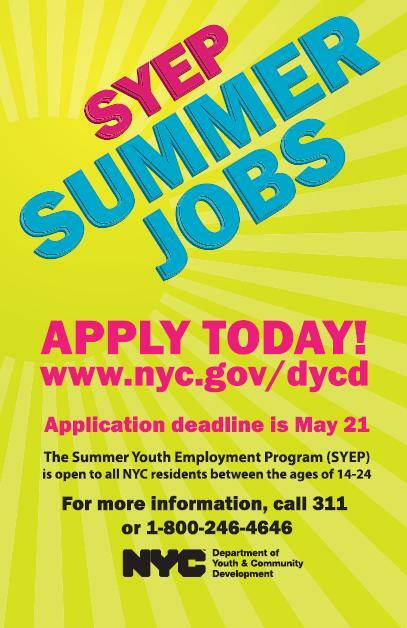 The application process for this summer (2013) doesn’t begin until April, but when the application becomes available, you should be able to find it on their website (http://www.nyc.gov/html/dycd/html/jobs/summer_youth_employment.shtml) and we will make sure to post a link as well. is it first come first serve ? I’m not positive – but you can contact SYEP at 1-800-246-4646.